If you are looking for the best Chicken Parmesan recipe, look no further! This Parmesan Crusted Chicken is crispy, juicy, and full of incredible flavor, yet it is baked for a lighter version of this Italian Classic! 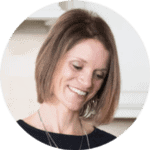 For more Italian Favorites, check out Oven Baked Meatballs, Easy Lasagna, or Slow Cooker Baked Ziti. One of my all time favorite meals is Chicken Parmesan. I adore the crispy chicken smothered in rich marinara and mozzarella cheese…..I mean, there is not much not to like about that, right?! This classic Italian dish is typically pan-fried and has a reputation of being a heavy dish. I make my Chicken Parmesan lightened up, but every bit as tasty as the classic. While I love restaurant’s Chicken Parmesan, I love my Oven Baked Chicken Parmesan just as much, if not more. 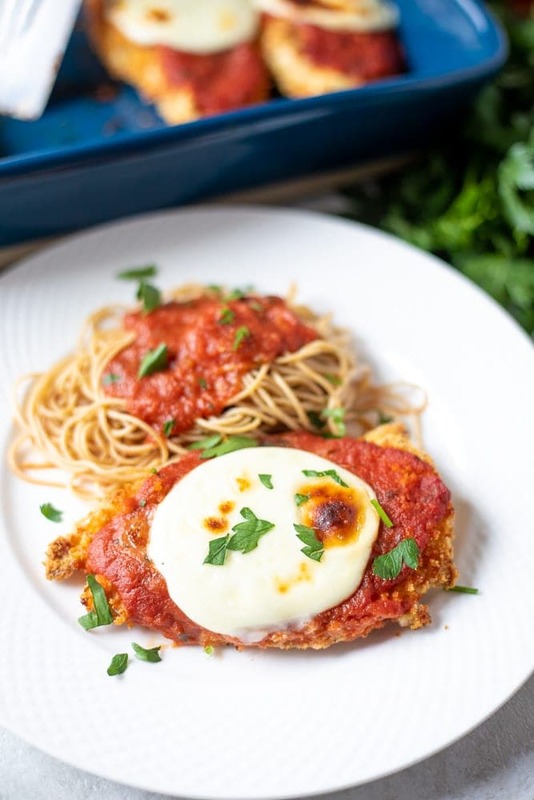 This Parmesan Crusted Chicken is full of flavor, crispy, juicy, and when smothered in tomato sauce and fresh mozzarella, it is simply PERFECT! Truly one of my all time favorite comfort foods. There are a few tricks to making incredibly crispy breaded chicken in the oven. I used these same tricks to make Chicken Tenders, which is another family favorite. Panko Breadcrumbs–The panko breadcrumbs give this chicken crunch and texture. I highly recommend panko breadcrumbs over Italian breadcrumbs whenever possible. High Heat–By using a high temperature, the breading has a chance to brown before the chicken gets overcooked. 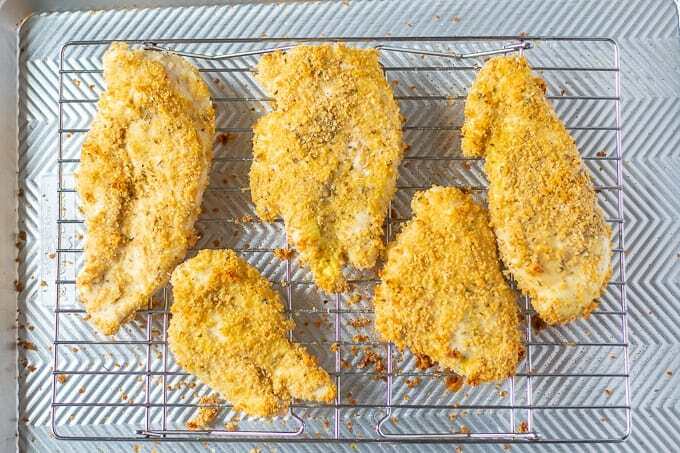 Baking Rack–It is so important to cook this Parmesan Crusted Chicken on a baking rack placed on a sheet pan. By elevating the chicken on a baking rack, the heat can circulate evenly, allowing the breading to brown evenly. I love to buy thin chicken cutlets to cut down on preparation, but they can be expensive. You can make chicken cutlets easily yourself. Place one hand flat on top of a chicken breast and holding knife parallel to the cutting board, slice it horizontally, from the thick end to the thin end, into two even pieces. Place chicken in between two pieces of plastic wrap. Pound chicken breasts with meat mallet evenly. Set up three shallow dishes. 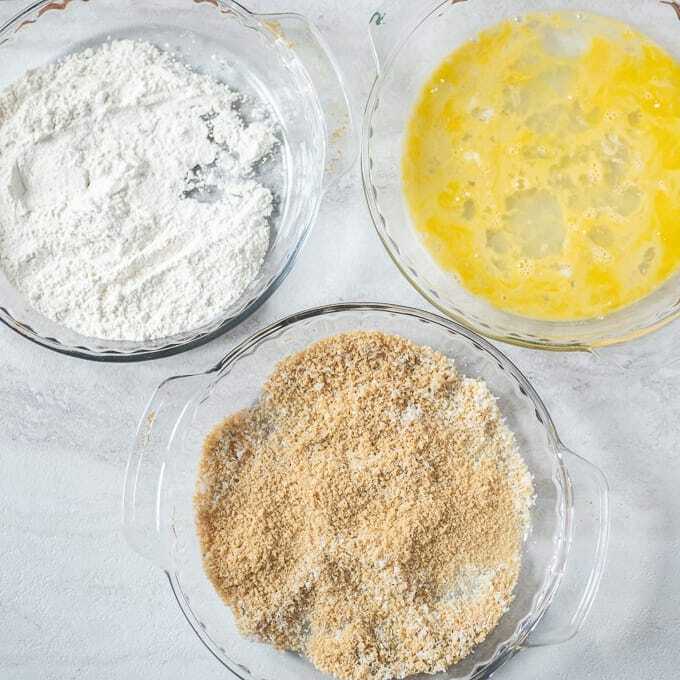 In first dish, mix together flour with seasonings. In second dish, whisk together eggs. In third dish, mix together breadcrumbs, Parmesan cheese, and seasonings. Dredge chicken in flour, shaking off excess flour. Dip in egg mixture, shaking off excess. Evenly coat chicken with breadcrumb mixture, gently pressing the mixture into the chicken to coat. Place chicken on rimmed baking sheet that has been lined with a baking rack. Lightly spray chicken breasts with olive oil cooking spray. Place breaded chicken in 9×13 pan. Top each chicken breast with 1-2 tablespoon marinara sauce and 1 slice of fresh mozzarella. Return to oven and bake for 5-8 more minutes, or until cheese is browned and melted. Chicken Parmesan is traditionally served with spaghetti and marinara. I love to serve it with a tossed salad and garlic bread. I love to use whole wheat panko breadcrumbs, but regular panko breadcrumbs work as well. For the best flavor, use freshly grated Parmesan cheese instead of jarred Parmesan. If you don’t have baking rack, use an oven safe stainless steel cooling rack instead. If you don’t have either, place breaded chicken directly onto greased baking sheet and flip after 5 minutes of cook time. If you love garlic flavor, feel free to add 1 teaspoon of garlic powder to the bread crumb mixture. Preheat oven to 425 degrees. Place baking rack on top of rimmed baking sheet. Lightly spray with olive oil. Place chicken in between two pieces of plastic wrap and pound chicken breasts with meat mallet evenly. Season each side of the chicken breasts with salt and pepper. Set up three shallow dishes. In first dish, mix together flour with 1 teaspoon salt and 1 teaspoon oregano. In second dish, whisk together eggs. In third dish, mix together breadcrumbs, Parmesan cheese, 1/2 teaspoon salt, and 1 teaspoon oregano. Dredge chicken in flour, shaking off excess flour. Then dip in egg mixture, shaking off excess. Finally, evenly coat chicken with breadcrumb mixture, gently pressing the mixture into the chicken to coat. Repeat process with each chicken cutlet. 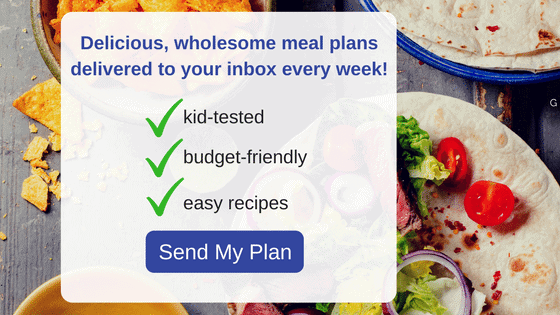 Place breaded chicken on rimmed baking sheet that has been lined with a baking rack. Lightly spray chicken breasts with olive oil cooking spray. Remove baked chicken from oven and place breaded chicken in 9x13 pan. If using chicken breasts instead of chicken cutlets, cut into cutlets. Place one hand flat on top of a chicken breast and holding knife parallel to the cutting board, slice it horizontally, from the thick end to the thin end, into two even pieces. 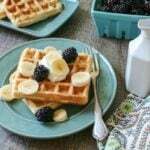 I love how flavorful this easy recipe is! So good! I love Chicken Parmesan too and yours looks super delicious! I like the idea of baking the chicken instead of frying and I agree that the panko crumbs are the way to go. 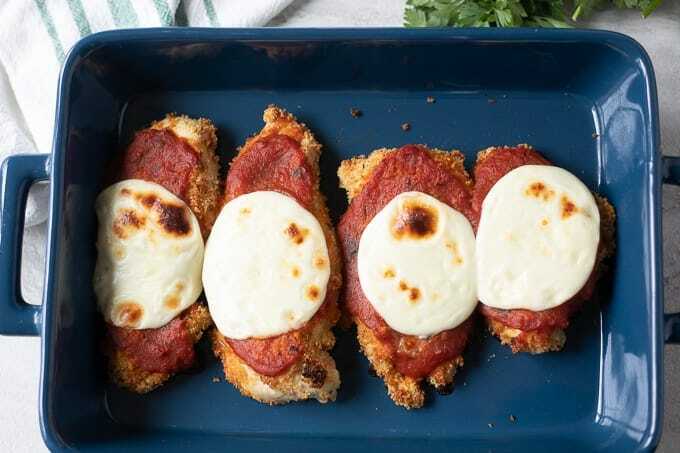 I’m going to try this next time I plan to serve chicken parm.